“When the day of Pentecost had come, they were all together in one place. And suddenly from heaven there came a sound like the rush of a violent wind, and it filled the entire house where they were sitting. Divided tongues, as of fire, appeared among them, and a tongue rested on each of them. All of them were filled with the Holy Spirit and began to speak in other languages, as the Spirit gave them ability” (Acts 2:1-4). I’ve always been shy. Just thinking about gathering with dozens of strangers and getting to know them makes me anxious and bashful. I never expected to spend a year in Brethren Volunteer Service helping plan that sort of event. Well, actually, three: Christian Citizenship Seminar (April 27-May 2), Young Adult Conference (May 24-26), and National Junior High Conference (June 12-14). During my service in Elgin, Ill., with Youth and Young Adult Ministries of the Church of the Brethren, I am responsible for shepherding people and wrangling details that allow these events to succeed. Each event promises to kindle the flame of community that fills us with warmth and light. As all who attended a powerful denomination-wide event know, there’s something special about being gathered together to worship God under one big roof. Our hymns sound the richest, our prayers feel the deepest, and God’s spirit is the most palpable when we cross boundaries of race, gender, theology, and geography to simply be together. 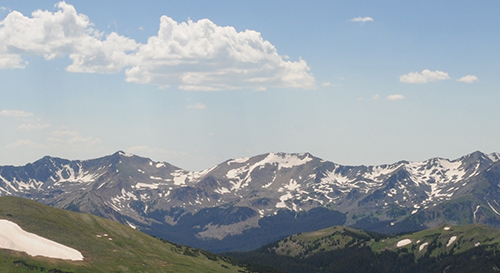 As I’ve learned through summers in outdoor camping ministry, the potential for transformative community-building is amplified by the youthfulness and hopefulness of the people who go to these events. Because of their energy, their generosity of spirit, and their capacity for fun and friendship, youth and young adults are natural community-builders. This makes youth and young adult events of the Church of the Brethren ripe for interactions that resemble God’s beloved and sacred community. 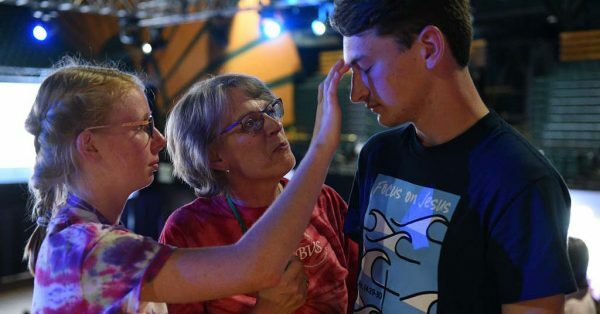 Simply put, youth events like CCS, YAC, and NJHC are the moments when Pentecost comes alive—not a moment in the liturgical calendar but a revelation of what community looks like when anointed by the Holy Spirit. When we gather, we build our community upon love, free ourselves of jaded inhibition, and embrace diversity to foster unity. We find ourselves enflamed with love for God and each other. We develop an uncanny talent for speaking to one another in a language we can all understand. I sometimes wonder how a shy person like myself would have fared at that first Pentecost. Could I have come out of my shell enough to speak to my neighbors in their own language? Could my energy sustain tongues of fire upon my head? 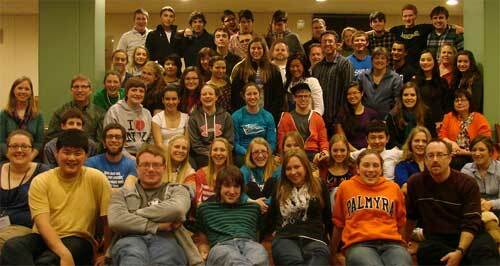 Then I remember my own National Junior High Conference and my first Young Adult Conference. Those were moments when I felt enveloped by the community of God. This happened, not in spite of my quiet nature, but because in God’s kingdom, there is plenty of room for both extroverts and introverts. I belonged. My hope for these events—much more than every detail being in its place—is for a spontaneous outbreak of community. May it spread like wildfire, and may it burn in each person’s own unique way. And may we be present in that moment to watch with wonder the church born anew in another generation. Learn more about Youth and Young Adult Ministries of the Church of the Brethren at www.brethren.org/yya or support them today at www.brethren.org/givediscipleship . 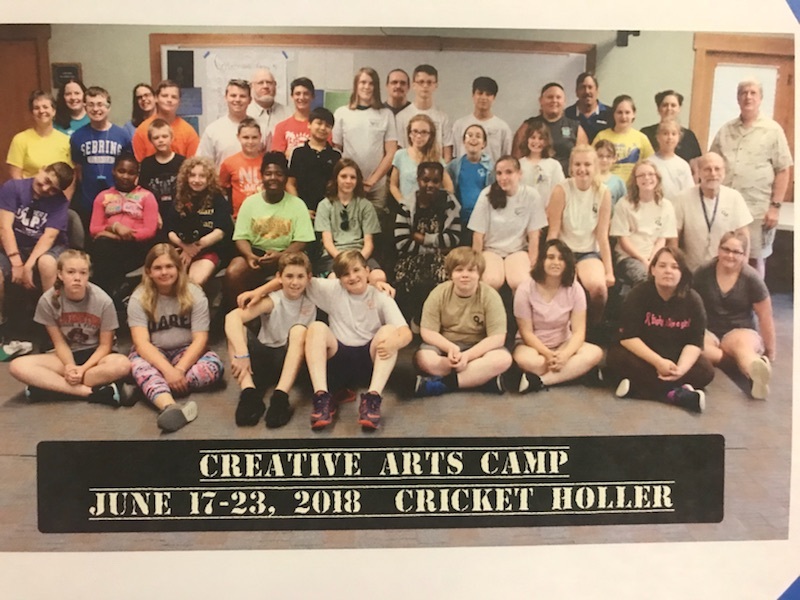 My cup is full as I enter in to the rest of my summer, starting with the beautiful souls at the Southern Ohio Creative Arts Camp. Over this week, these campers blew me away with their love for one another, their willingness to have conversations about tough subjects, and to open their hearts to many brand-new faces, including my own. The folks here were open to me bringing new ideas that might have seemed a little out of the box at first, such as clowning and improvisation. But after a little time, I think they started to celebrate their own passions, realizing that they can be mouthpieces for the campers’ causes as my passions have become for me. My first session was with a group of 12 campers ranging from 6-18 years old. They all had so much to add to our conversation about peace and were so willing to jump into the little bit of clowning we did. Bible Study gave us many openings to enter discussion about what it meant to speak up. We talked about the causes we felt most passionate about and how we could be advocates for the things we feel are important. For one of the girls I talked to, that issue was women’s rights, and I got to have a lovely discussion with this young activist about what that meant to her. On Thursday night, I saw a true show of peace during a foot washing service. Before feet washing, Pastor Carl asked the campers and the counselors that if anything was laying on their hearts to let it be lifted by going to the person and giving them a hug. Adults, take notes! These children, who during camp became practically like a family even to the point of bickering, put away the jokes and the arguments and embraced each other. They asked for forgiveness, and pardoned their brothers and sisters in Christ. It was a truly beautiful thing! As we washed feet, we sang “Will you let me be your servant?” During the last verse, as everyone finished, we joined together in unison to sing the last chorus. The peace of Christ was truly tangible in that room! 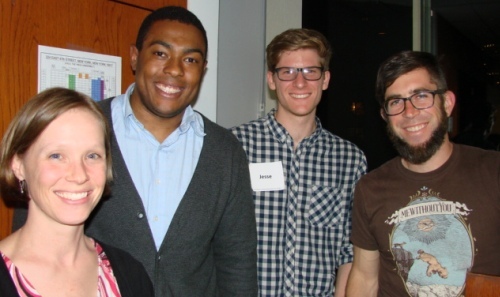 Richard Newton, Jesse Winter, and Nate Hosler. On April 23rd, Church of the Brethren youth from around the country met in New York City to learn about mass incarceration at Christian Citizenship Seminar (CCS). After hearing from Dr. Richard Newton, a professor at Elizabethtown College, and Ashley Ellis, an advocate for persons reentering society, the youth began to see the connection between mass incarceration and racism in the United States. The youth traveled to Washington, D.C. to continue learning about the issue and to prepare for legislative visits with their senators and representatives. During their visits to Capitol Hill, the youth asked their legislators to support sentencing reform legislation and bills that aided with prison reentry programs. Melen Ghebrai from Olympic View Church of the Brethren (Seattle, Wash.) offered the following reflection about her time at CCS. CCS was an incredible life- changing experience. We began the week instantly exposed to the injustices of the criminal justice system and the immediate urge of reconstruction rather than reform. Each day we had new speakers explain what was happening and why it was important. I recognized the injustice but was confused about what we could do about it. As a high school student and person of color, all throughout my life I have been given the impression that my opinions on certain social and political issues do not matter. CCS, however, changed my doubt and gave me the voice I longed for. Throughout the week each powerful speaker built my passion, interests, and my desire to advocate for a renewed system in society that provides redemption and mercy for its citizens. At CCS, I met several students from around the U.S and even overseas who share the same faith as me and belong to the Church of the Brethren, and this created a sense of community. We learned beside each other and asked questions, which fueled our interest and passion. As the week came to an end, we divided into groups for our lobby visits. I was accompanied by a volunteer from BVS, but did the visits mostly on my own. The experience was rewarding and very powerful. Just a week prior I was sitting in a classroom advocating for students pushed from the school to the prison pipeline. It was nice walking through Capitol Hill and meeting with senators and representatives who are pushing for an end to this destructive system. CCS is something I would be very happy to attend next year. It was an opportunity that opened new doors and enlightened youth about the importance of remaining socially aware on the issues and solutions that shape our country. Christian Citizenship Seminar is organized by the Office of Public Witness and Youth and Young Adult Ministries of the Church of the Brethren. Learn more about CCS at www.brethren.org/ccs, or support this ministry today at www.brethren.org/give. 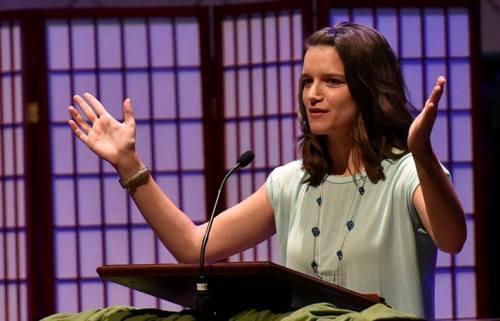 Lauren Seganos preaching at National Junior High Conference in July. “Take your everyday, ordinary life—your sleeping, eating, going-to-work, and walking around life—and place it before God as an offering” (Romans 12:1-2, The Message). What comes to mind when you hear the word “offering”? I think of the offering plates we pass during worship. Children drop in pennies or quarters. Adults write checks to their congregation. And these offerings are collected to pay the pastor’s salary, the church air conditioning bill, or for a rented van so the youth can go to National Junior High Conference. Now imagine what it would look like if, instead of dropping money into the offering plate, you hopped into the plate yourself? Imagine sitting in the plate, your knees bent to your chest, and grabbing the sides of the plate with each hand. People pass you along, probably giving you strange looks, and the experience reminds you of crowd surfing. What a ridiculous thing to imagine, being in the offering plate with envelopes and cash. But what might it look like to be an offering to God? How might that work? Growing up, I loved to sing, and from what I could tell, the people around me enjoyed it too. I grabbed every opportunity to do it—in school and community choirs, in school musicals, at school basketball games, and at church. Singing was something that brought me joy. But in junior high and high school, a friend always sang better, getting the part whenever we auditioned for musicals or solos in concerts. No matter how hard I tried, she always performed better than me. Once, I was asked to sing at a coffee house, but out of spite or pride, I refused. “I’m not as good as her, so why sing at all?” I thought. I wasn’t special or unique, just an ordinary, average singer. After college, I realized that even though I won’t sing for a career or be the best, it doesn’t mean I shouldn’t sing at all. Today, you’ll find me singing while I’m doing everything, especially while driving my car or cleaning my apartment. I know now that singing is one of the best ways to nourish my soul and praise God by using my gift. Maybe you can relate. Is there something that nourishes you and gives you deep joy? Maybe you do it every day: like kicking around a soccer ball, writing stories, or drawing. Maybe you make people laugh, or help others feel included and loved. These are gifts God has given you. And it’s not about being the best. It’s about using those talents every day, in ordinary ways, to bring joy to yourself, to others, and to God. This is what it looks like to be an offering to God. Lauren Seganos is a licensed minister at Stone Church of the Brethren in Huntingdon, Pa.. To hear the full version of this sermon visit www.brethren.org/podcasts . Learn more about National Junior High Conference and Youth and Young Adult ministries at www.brethren.org/yya or support them today at www.brethren.org/give . Participants at Christian Citizenship Seminar in 2013. Christian Citizenship Seminar happens each year and is a powerful experience for all who attend. 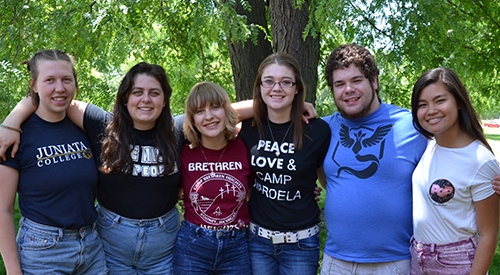 CCS brings together youth who are passionate, discerning, and concerned about justice and the well-being of our denomination, our communities, and our nation. Participants of past years have shared that their week at CCS was filled with experiences they remember for the rest of their lives. The 2015 Christian Citizenship Seminar, held April 18 – 23 in New York City and Washington D.C., will focus on the complexities of US immigration policy, suggested reforms, and the consequences of both on immigrant communities. At CCS, high school aged youth and their advisors will explore the issue of immigration and the ways in which faith helps understand and form beliefs about it. This experience will help equip them to understand immigration and to educate their own communities about issues related to immigration. 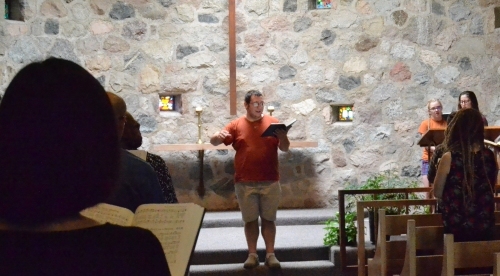 During this week-long event, participants will explore the ways in which their lives intersect with the lives of immigrants through hearing personal stories from immigrants in the U.S., people who work with immigrants, individuals who are connected with both theology and immigration, and those who work in advocacy and policy-making. Participants will gather new cultural insights in New York City through attending multicultural church services and the United Nations, and in Washington, D.C. they will visit Capitol Hill and meet their representatives and senators to discuss the topic of immigration. Throughout the week, there are important times to get to know other participants, worship together, and reflect upon the day’s events. Through this conference, students are empowered to take home what they have learned, stay informed about the issue of immigration, and to share about their learning experiences to teach others. Thank you for supporting great learning opportunities like these that build community and train leaders to address the needs of today. Learn more about Christian Citizenship Seminar at www.brethren.org/ccs or call Kristen Hoffman at 847-429-4389 or email her at khoffman@brethren.org. Support this and many other life-changing conferences at www.brethren.org/give .